Let Your Guests Marvel At Your Taste In The Most Subtle, Chic Way - Starting Today! Are you a person with an eye for elegance and a taste for refined luxury? Aren't you sick and tired of unassuming, bland coasters ruining the otherwise carefully crafted style and image of your office or home - or, even worse, garish ones that scream "tasteless"? If these sentiments sound all too familiar to you, then you'll surely be delighted to get your hands on a set of Moderni Lifestyle premium marble coasters. You'll immediately find out they're exactly what you've been looking for, and more! Let's be honest here; coasters are a must if you want to protect your expensive furniture from water ring marks, spills, and scratches - but, just as importantly, they're also another part of your home or office's decor. Using simple, cheap, or bland coasters will only ruin the image of chic elegance you've strived so hard to create. The right ones, however, can take your decor's sense of style to a whole new level! Moderni lifestyle coasters are beautifully crafted from the world famous Makrana marble, and specially designed to fit right in with both classic and modern interior decoration styles. Not only will their protective cork backing keep your furniture safe, they also give off an aura of stylistic superiority you will come to admire at once! If Makrana marble is good enough for the Taj Mahal, it should do beautifully for your home! Need we really say more? Just Click "Add To Cart"! 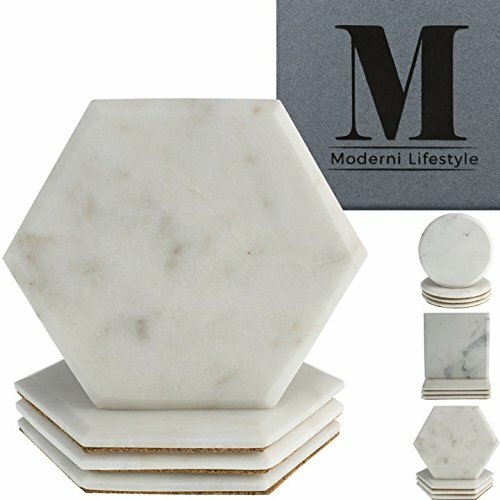 ADD A TOUCH OF CLASS & ELEGANCE ON YOUR TABLE - Handcut from the same source as marble in the Taj Mahal, Moderni Lifestyle coasters are truly fit for a King or a Queen. It's the details that truly set class and refined style apart from everything else. So let these details speak volumes for your personal taste - choose a set of luxurious marble coasters for your guests to leave their drinks and fine glasses on, and let them stare with admiration! 3 BEAUTIFUL DESIGNS TO MATCH YOUR PERSONAL TASTE - Moderni Lifestyle coasters come in 3 different designs for you to choose from. Round for an all-time classic approach, square for a powerful and distinguished image, and hexagonal for those free souls of truly unique tastes! MADE FROM LUXURIOUS MAKRANA MARBLE - When it comes to marble coasters, it's best to leave lesser materials to those with less discerning tastes. Moderni Lifestyle coasters are made exclusively with Makrana marble with less than 2% imperfections. This means that you can have the very same world famous marble that was used to build Taj Mahal, right there on your table under your glass of scotch or wine! A DISTINGUISHED GIFT IDEA FOR YOUR LOVED ONES - Are you looking for an elegant, chic present idea for one of your friends, coworkers, or loved ones? If that's the case, look no further. Nothing says "good taste" like a set of Makrana marble coasters, presented in a luxurious gift box! PLUS, YOU CAN BE A FORCE FOR GOOD! - With Moderni Lifestyle, part of the B1G1.com "Business For Good" initiative, you can actually make a difference in the world! With every coaster that you buy, you're helping B1G1 (Buy 1 Give 1) help young Dalit girls learn to read and write. These women are the future and your support makes a difference to their lives. If you have any questions about this product by Moderni Lifestyle, contact us by completing and submitting the form below. If you are looking for a specif part number, please include it with your message.